ABOVE: Medical staff carry James Dorbor, 8, suspected of having Ebola, into a treatment facility in Monrovia, Liberia, on Friday. When a starving Ebola patient escaped from a treatment center in Monrovia and staggered through a crowded market in search of food, bystanders who scattered in his path voiced their anger — not at him but at Liberia's president. To many in this impoverished West African country, President Ellen Johnson Sirleaf's government has not done enough to protect them from the deadly virus. 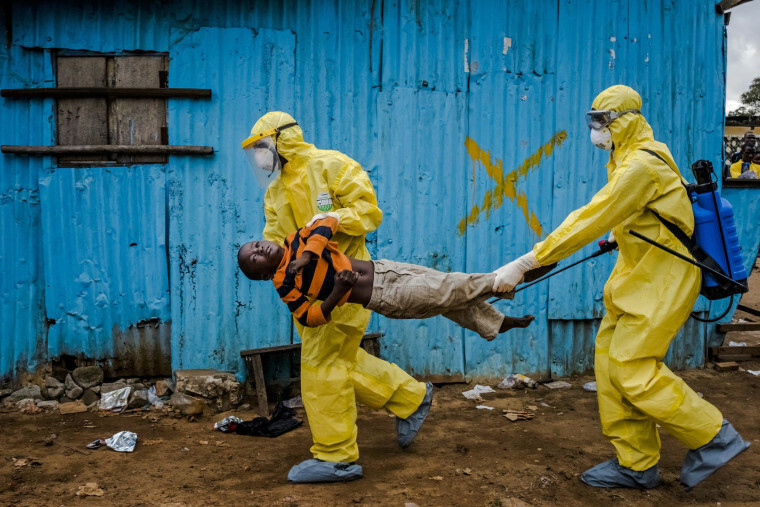 Ebola has killed more than 1,000 people in Liberia since its arrival six months ago. Across West Africa, the death toll from the world's worst Ebola outbreak has surpassed 1,900. Panicked residents said the patient was the fifth to escape in recent weeks from the understaffed ELWA hospital. Dozens watched anxiously as workers in protective clothes bundled the struggling patient into a truck and drove him back. "The patients are hungry, they are starving. No food, no water," said one terrified woman in the crowd.